Simon Birkett, Founder and Director of Clean Air in London (CAL), attended personally the Court of Appeal (Civil Division) on 28 and 29 November 2011. This case has implications for the Information Commissioner and every person who requests environmental information in future. The Information Commissioner joined Birkett in opposing Defra at the First-tier Tribunal. At the Upper Tribunal the Information Commissioner argued for a ‘middle way’ whereby he and/or the First-tier Tribunal had a discretion whether to allow reliance on a different exception or exceptions. He chose not to appear at the Court of Appeal. Birkett has argued that the deadlines are mandatory. Birkett was represented by Gerry Facenna and Laura Elizabeth John of Monckton Chambers and Gita Parihar and Laura Gyte of Friends of the Earth’s Rights and Justice team. 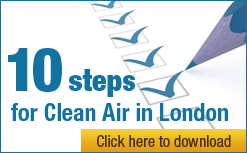 “The appeal was an important part of an ongoing three-year battle with Defra to obtain environmental information relating to discussions between the previous Government and the Mayor of London on matters of air pollution and the UK’s compliance with European Union air quality laws. “Environmental information laws are very powerful. It is disappointing therefore that Defra has been able so far to: miss unlawfully both mandatory deadlines to respond to the request for disclosure of environmental information; fail to rely on the correct exception or exceptions for withholding the information (which would anyway have required a balancing of public interest); and then come up with new reasons for refusing to disclose the information – after the Information Commissioner had ruled against it. I am seeking advice on whether to challenge the Court of Appeal’s decision or return quickly to the First-tier Tribunal to continue the fight against Defra’s appeal against the Information Commissioner’s decision that it must release all the information requested. “I remain of the view that the information Defra is still withholding may include an admission that the UK is in breach of EU air quality laws for dangerous airborne particles in London. The case has now been referred back to the First-tier Tribunal subject to any appeal.